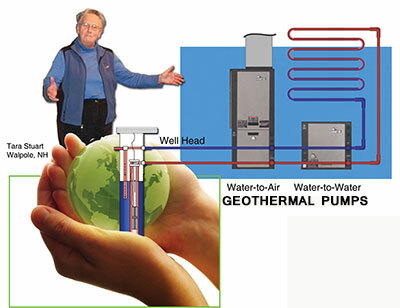 Geothermal | Integrated Solar Applications Corp.
What? Geothermal systems (aka: GeoExchange) transfer heat from one location (in the ground or in water) to another location (your building). Geothermal systems can provide heating in the winter and cooling in the summer simply by turning a reversing valve. Geo-thermal fuel is unlimited, renewable, and accessible in virtually any location in the world. How does it work? At the heart of a Geothermal system are the ground loop (the source temperature) and the heat pump (the way to make the ground temperature usable for heating or cooling). The ground loop is typically one or more drilled wells (vertical), field buried pipes (horizontal), or lake or pond submerged pipes (open source). A heat pump works based on the principle that heat moves from a higher temperature to lower temperature. The heat pump through compression and expansion of a refrigerant gas increases and then decreases the temperature of the gas. Who? Geothermal systems can be applied to virtually any building heating or cooling need; single-family, multi-family, commercial, industrial, rural or urban. Drilled wells, vertical systems, are the predominant choice in the Northeast for ground loop systems. In some situations existing wells can be used. Geothermal systems offer cooling without additional cost. With very little maintenance Geo-thermal systems provide owners peace of mind and low cost operation. Optimal greenhouse gas CO2 emissions reductions are achieved by coupling wind or solar photovoltaic electric production with Geothermal. Why? According to the Environmental Protection Agency, GeoExchange is the most energy-efficient, environmentally safe, and cost effective conditioning system available. GeoExchange heat pumps can reduce energy consumption and emissions by over 40% compared to air source heat pumps and over 70% compared to electric resistance heating. In comparison to all other fuel technologies, GeoExchange systems are 48% more efficient than the best gas furnaces on a source-fuel basis, and 75% or more efficient than oil furnaces.